Photo by Sophia Dao/Stanford Daily. 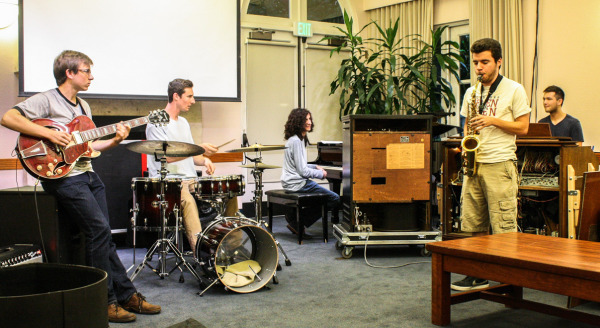 The Stanford Jazz Consortium (SJC) is a student-run group, which welcomes both avid jazz lovers and curious musicians in the Stanford community. The group organizes on-campus performances and master classes with acclaimed jazz artists. SJC hosted its first guest performance on Sept. 30: The Jazz Trio Charged Particles – featuring Murray Low on keyboards, Aaron Germain on bass and Stanford Professor Jon Krosnick on drums – electrified Bechtel International Center. Founded by current grad student Matz Haugen, SJC continues to draw musicians together under the leadership of Kevin Coehlo ‘17, SJC president and Kimball academic theme associate. Coehlo, who has performed and taught at the Stanford Jazz Workshop for the past eight years, sat down with Arts & Life writer Sophia Dao to talk about jazz and the SJC. TSD: Have you always been really into jazz or was that something that morphed and transformed over time? KC: I started off doing classical piano and violin. Then I heard Booker T. & the M.G.’s play “Green Onions” on the radio—and then jazz came along. It was a natural evolution for me. TSD: Where do you guys usually play? Here [CoHo]? Bay Area? KC: We’re all over the place. We go and play off campus for our personal careers, but when we’re on campus, we go to CoHo pretty often. We have Monday jams through the Stanford Jazz Workshop in Kimball. TSD: What is your favorite thing about the Consortium? KC: My favorite thing is seeing how people come together for a common goal, common love. Really, music is a language, and jazz, in particular, is a diverse language. Seeing the ways that people connect through jazz and speak to each other has always been great. Having those energetic sessions where people come together and play together is really a lot of energy at once. You know, it doesn’t have to be a show or anything professional. We had a really great moment at Admit Weekend last year with a big jam session and lots of ProFros involved. It was nice to see people meshing and really getting to know each other through their music. TSD: Stanford Jazz Consortium recently hosted the Charged Particles trio. Do you guys usually bring in a lot of groups every year? KC: We had Jon Batiste in fall quarter last year and then a big concert with Ray Obeido’s group, featuring Peter Michael Escovedo and Pete Escovedo – the original percussionist for Santana. The Charged Particles trio came earlier this quarter and that was great. TSD: What other artists are you bringing this year or in the future? KC: We have some big names coming in, including Dayna Stephens and Joe Gilman with the Brubeck Institute Fellows. Joe Gilman will be coming January 14 to Campbell Recital Hall. We chose performers not just because of their reputation but also because they’re going to be able to really connect with Stanford on a personal level. They’re all great musicians—and even better human beings. TSD: What’s the best way to get involved? Just find one of you guys at one of your gigs? KC: Absolutely. We publicize on our Facebook page. I find that oftentimes when people go to something for the first time, and experience the energy of being part of the audience, it’s hard not to come to more gigs. I got my first taste of that pretty young, and it’s been my goal to expose more Stanford students to what it’s like as a jazz audience member and to treat music not just as music but as a way of life. Contact Sophia Dao at sdao “at” stanford.edu.